This spring research showed that prices have risen 50% over the past five years in Holland. Oops! The general feeling that retailers have taken advantage of the introduction of the Euro has proved to be correct. Many will not eat less because of this, but those around me are suddenly economizing considerably. Suddenly it has become cool to want less. This can be a very creative pursuit. Much of today's net surfing is aimed at finding better deals. Young French Artist Matthieu Laurette has literally made economizing his art form. Laurette has been living for years thanks to not-satisfied-money-back and free-trial stunts in supermarkets. 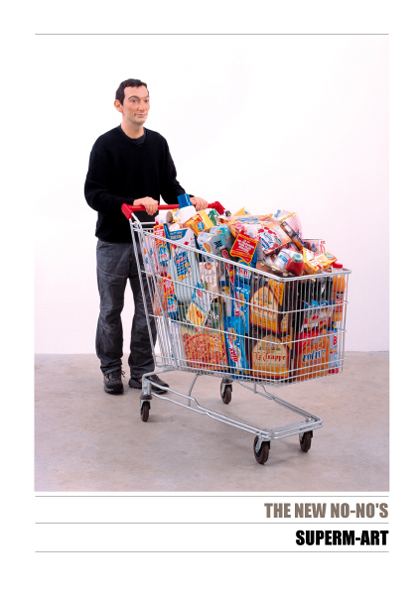 His art is all about sifting out folders, asking for separate receipts and informing manufacturers that their products have not been 100% satisfactory.